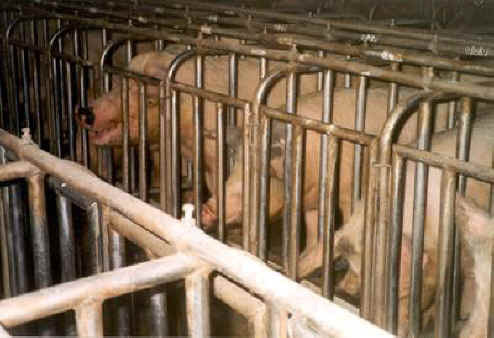 (Pig Exploitation - Gestation Crates - 06) In this factory farming operation, the pregnant pigs are totally enclosed in these extremely cramped crates. Any human woman who has been pregnant knows how uncomfortable pregnancy can be, and how torturous it would be to be unable to change her position, forced to suffer day in and day out all her life, as these pigs are. To treat any living being this way is evil.